Private Personal Training provides an opportunity for you to move at your own pace and respect your limitations. You will improve cardiovascular, strength, balance or yoga skills. Become familiar with the studio before joining in a group class. Your one-on-one time with Mary Ann can be designed especially to suit your individual needs and goals. Work together to set a time that is best for your schedule. You are new to fitness or yoga and need guidance in establishing a solid foundation. You would like to enlist the aid of an experienced teacher to co-create a home practice that meets your specific needs. Your busy schedule does not permit time to attend a studio class. You are easily distracted or feel competitive in group classes. You are an athlete and want to create a bridge between sports activities, or you want to create complementary training to your regular regimen. You have reached a plateau in your training and need more individualized attention to move to the next level. You need assistance working with an injury or illness. Who can benefit from personal instruction? 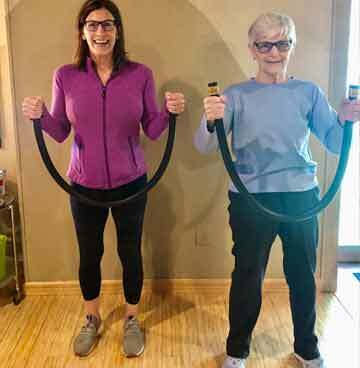 Athletes: Private Lessons are an excellent complement to personal fitness training and provide excellent cross-training support for athletes who wish to enhance flexibility, stamina and strength, as well as to create balance between seasonal sports. New Students: As a new student, you may be intimidated by the group class environment. One-on-one instruction allows your teacher to focus on your specific concerns as a new practitioner and can help prepare you for regular yoga/fitness classes, as well as provide ongoing support. Experienced Students: Gain deeper insight into specific equipment that interests you try the BOSU, TRX, and more.. Time spent with your instructor can help you reach your goals while focusing on a more complex understanding of anatomical alignment, energy and breathing. Contact Mary Ann for more information 304 641 6827 Private $55 Semi Private $35 each. Mary Ann is certified with...ACE, American Council on Exercise #F25274, NASM National Academy of Sports Medicine #2984790, 200 Hr RYT Registered Yoga Teacher.